The following is a guest post by Gareth Cartman. Gareth is Director of Digital Marketing at CLD, a digital agency based just outside London. Gareth has previously held a range of marketing and publishing roles, with a focus on digital. He also has two kids and a lifelong affliction of supporting Everton and the Boston Red Sox. I am a social cynic. You may have noticed that, despite my social presence on a variety of networks. I’m old school. I grow bored by conversations about likes and shares. After all, what is a like if nothing but a click on a ‘like’ button, quickly forgotten, and of no subsequent substance. And if Facebook only displays your content to 10% of those who like your page, then really – what is the point of a like. Social metrics make me even more cynical. The measurements exist in their own universe, with little depth or relevance to the real world. So what if a hashtag has been mentioned a thousand times? So what if our page has been viewed two thousand times? 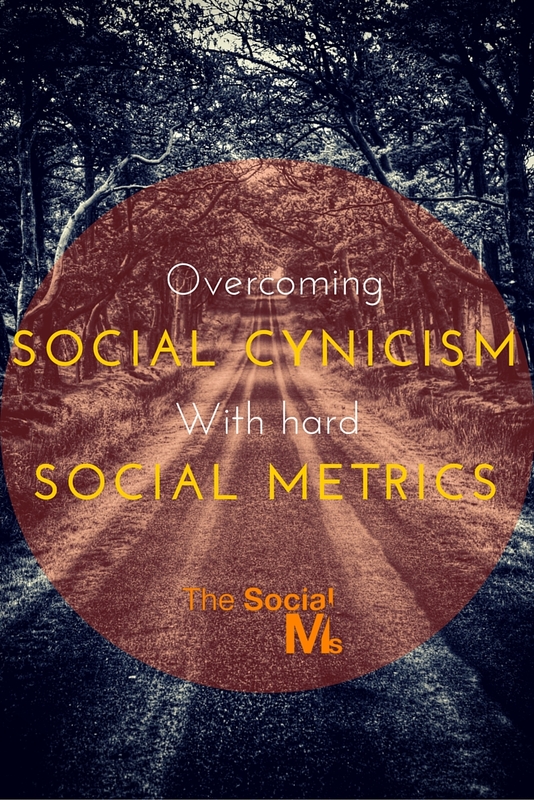 Social measurement needs hardening. It needs to move into the SEO measurement space, and quickly, otherwise it becomes another form of PR, pulling the ‘woolly’ over our eyes. Again, it amazes me that the PR industry gets away with so much wooliness, we can’t let social continue down the path of smoke and mirrors that PR gets away with to such an extent. Volumes mean nothing. In the old days of SEO, people reported on traffic volume as if traffic volume was the only thing that mattered. As we all know, you can send a thousand visits for $10 and drastically alter this figure. Volume means nothing. There are people who drink massive volumes of alcohol, that doesn’t mean they’re right. 10 shares and 50 comments – now we’re starting to talk about something a bit more meaningful. However, it’s still in the realms of the woolly. They can be acquired, and they can happen in their own isolated universe, detached from the hard realities of who’s buying your stuff. Who shared? Who commented? Are they prospects or are they customers? And can we gauge the sentiment? This post from my old colleague Warren Butler highlights the possibilities of sentiment measurement within CRM, and while it doesn’t have to be within a CRM, the ability to cross-reference with customer data takes metrics into the real world quite nicely. 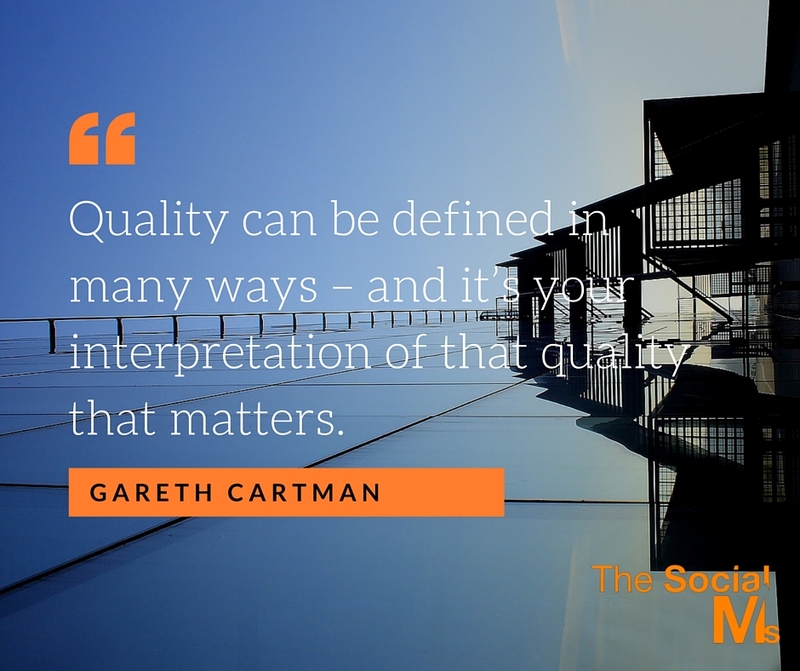 Quality can be defined in many ways – and it’s your interpretation of that quality that matters. So long as you’re consistent in what you’re measuring, you will be able to properly assess your social activity through metrics that relate back to your actual business goals (i.e. sell more stuff). Clickthrough data means something in the world of PPC and SEO – so long as there is a nice correlation between keyword, ad copy and landing page. It’s a great secondary measurement behind conversion rate and cost per click. However, in the world of social, it can be manipulated, and worse, it can mean absolutely nothing. However, when they move onto one of your properties – your website, principally, you can start to analyse what they’re really doing. And this is where social metrics gets really interesting. Take, for instance, the difference between Twitter and Facebook visitors once they’ve landed on your site. I’ve frequently found huge differences in subsequent engagement, with many Twitter visitors leaving after one or two pages at most, and Facebook visitors (on desktop) staying for at least four pages. That’s quite common, but it will differ depending on the messages you’re putting out and the audiences you’ve acquired. But this is your chance to properly analyse your audiences – they all behave very differently once they’re on your site. 20 messages about this product, 50 messages about that product… not interested. Social listening is a growing thing. If you’re going to do market research, you can do worse than listen to what people are saying about you on social, without you necessarily provoking them into commenting. You can pay market research companies vast amounts of money, but social listening is (almost) free, so long as you have a brand big enough for people to talk about. You can set up your alerts and you can search for your brand all you like, the important thing is to distil this information into something understandable and actionable. The ultimate guide as to whether social has had an impact for you online is within your Google Analytics. Now, you may have noticed – especially if you are in the B2B world – that social, as a channel, doesn’t convert too well. This is less true in B2C where, for some retailers, Pinterest converts at a better rate than organic search. However, the true measurement of social is not in the direct conversion rates but in the supporting conversion rates. Analytics has developed over the years to include supporting conversion data, so you can see how social has contributed to the funnel. Whereas we traditionally measure ‘last-click’ conversions, we can now measure ‘first-click’ conversions and other supporting actions that led to someone either buying or making an inquiry through your site. This, for me, is the ultimate metric. All the clicks, likes and shares in the world can’t beat this level of intelligence. To learn that Facebook users come back as organic searches who come back as direct visitors is evidence that Facebook activity has built up sufficient interest for people to come back later through other channels. Those other channels will get the credit, much like a striker scoring from short-range, but this data gives social the credit your activity deserves. Harden your social reporting, make it relevant, make it real-world, and not stuck in the isolated environment of the social network itself. Then you’ll get the acknowledgment and the investment that you need.